A short walk round the hidden footpaths in Saltford Village, taking in the Brass Mill and The Shallows, and with lovely views over the river to Kelston Round Hill. 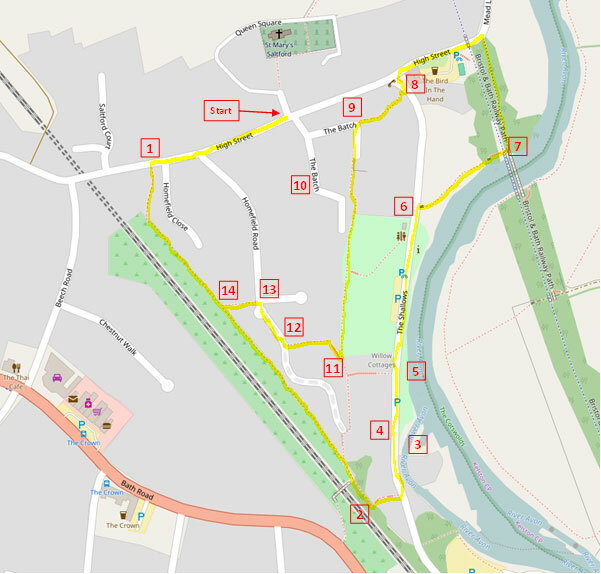 Distance: 1.3 miles, circular walk. Going: Easy; some steps and short hills. Facilities: The Bird In Hand. Toilets at The Shallows car park. A description of the buidings in the High St. can be found in Walk Eight. Walk up the High Street and just after Homefield Close turn left into the public footpath by the side of no. 16 (1). Shortly the path reaches the side of the railway cutting. Keep on this path, ignoring side paths to the left and right. As you look over the railway cutting towards the Kingfisher Lodge Care Centre, you get a good impression of just how much rock and soil must have been removed when the cutting and tunnel were dug - all by hand of course - back in 1836. Just past the bridge over the railway (that leads to the A4 at the top of Saltford Hill) (2), turn sharp left, over the stone stile, and down the steps to the road at the bottom. Turn left along the road. Very shortly you will pass the Saltford Brass Mill (3), one of a series of mills working in brass in the Avon Valley during the eighteenth century. The earliest main process involved the shaping of brass sheet into hollow-ware vessels, such as pans, bowls, and vats. Large water-powered hammers were used originally, to beat brass ingots into sheet, and then faster hammers shaped the sheet into hollow-ware. This beating process was known as 'battery', so Saltford Mill was known as a brass battery mill. It is difficult now to imagine how much noise the mill must have made; the constant and regular banging would have been a dominant feature of village life. For more about the Saltford Brass Mill visit www.brassmill.com. A little further on to your left (4) is a building that was built 1866 as a Methodist chapel at a cost of £200, largely funded by the Wills tobacco family. In 1930 it became the village Working Men's Club. It is now a private house. After you have passed a row of terraced houses on the left you will see a public footpath coming down steps (Granny's Steps or Granny Brookman's Steps) from the hill on the left (5). This marks the spot on the river where the passenger ferry used to cross to the opposite bank. If you look across to the other side you can see where the path led up from the ferry crossing and under the old railway (now the Bristol to Bath cycle path) on its way to Kelston. A photograph of Hannah Gregory navigating the ferry across the river is shown here. 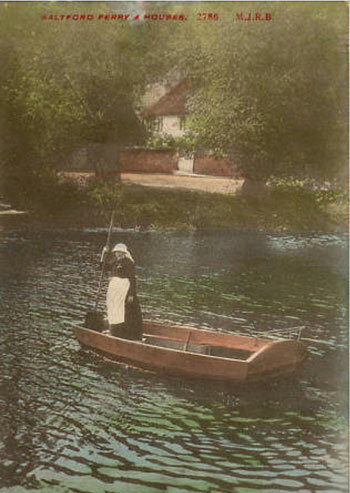 Hannah Gregory & Saltford Ferry (early 1900s). Next on your left is a row of cottages at right angles to the road. Now called Willow Cottages, these were formerly 'Ferry Cottages'. As you walk along The Shallows past the car park, look up to your left and, running along the top of the hill, you will see the path that you will walk back along later. You now have a choice of routes. Either turn right (6) through the gate onto the permissive path, or continue straight on to The Bird In Hand. The path can get overgrown and/or muddy, and involves going up steep steps, so if you choose to stay on the road, jump to (11). The path brings you close to the river and the span of the old railway bridge over it. The railway, the Midland Railway Bath branch, that ran to Queen Square station (now Sainsbury's), was opened in 1869. Climb up the steps to the railway path (7). Turn left here, but first take a few moments to look down at the river from the bridge. Kelston Station ('Kelston for Saltford'), 1930s. 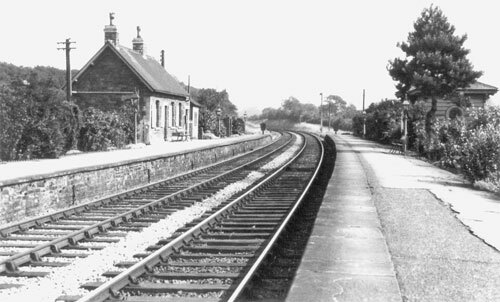 Just beyond the bridge (in the Bath direction) is the site of Kelston Station (see photograph above), which closed in 1948. You can still see that the bridge had a separate walkway for pedestrians to get to the station from the Saltford side of the river. You can now either walk, right, down the old station access path that leads down to the road, or walk for 50 metres or so along the railway path and left down the steps to The Bird In Hand car park. Walk up the road to the front entrance of the pub (8). Now go up the steep public footpath opposite the pub entrance. This leads up to The Batch (once named Green Batch) (9). Turn immediately left into another public footpath. There were many farms in Saltford in the old days. On your right as you go down this path you can see Batch Farm (also known as Cherry Farm) on the other side of the old orchard (10). This listed building is believed to date back to the 17th century. The 1861 census tells us that this was lived in by a farmer/butcher named Isaac Ferris, his wife, 3 sons and 4 daughters, ranging in age from 20 to 6. He farmed 50 acres. This pathway - once known as 'Dark Lane' - is a good example of what was once called a 'drumway', or more accurately a 'drangway' - a Somerset term to describe such a path between two high walls or hedges. As you come out in the open you have a wonderful view over The Shallows and across to Kelston Round Hill. The grassy area that slopes down to the road is still sometimes known as Cox's Close a name that was in use back in 1837 when the Tithe Map showed the names of all the fields in the parish. Back in the mid-20th century there was a wooden house above here called The Outlook, once lived in by a head teacher of the school, and the footpath along here is still referred to as The Outlook. 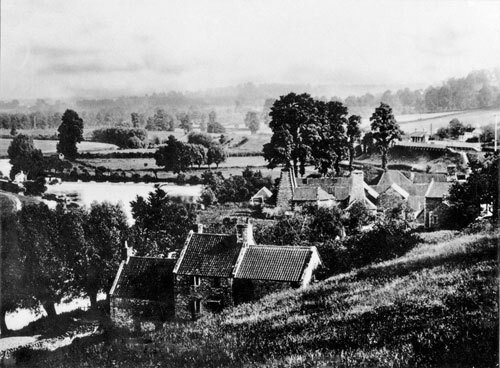 View south from The Outlook, c.1880, of the Brass Mill & Saltford Station. The LH cottage in the foreground was Hannah and George Gregory's. Photograph by Mr Stock, courtesy of Clevedon Civic Society & Woodspring Museum. Keep on this path until you reach a junction. (11) Turn sharp right up the hill. 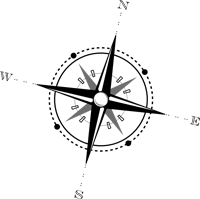 Further up, this path turns sharply to the left. Pause here to look back at the view. Particularly notice the path leading from the ferry under the old railway line that you saw before. From here you can see it leading straight up to Kelston in the distance. Old Kelston station was between the river bridge and the bridge over the path, and it will be immediately apparent that the station was nearer to Saltford than to Kelston! (When you reach the road (12) turn right, and after a short distance (13) turn left down another public footpath. At the T junction (14) turn right and you are on The Mallows path that leads back to the High Street.